The AquaVogue Aqua One tank I have came with an 850 l/h rated canister filter that I can't help feeling is just that little bit under powered in the 170 litre aquarium as the flow around the tank has always been very modest and I absolutely cannot manage to get any significant surface agitation or ripples etc... To be honest, I'm not that surprised that the filter in an all inclusive package would be only just adequate for the job... The one good thing about the filter is that it's very easy to work with and to be fair, a second good point is that it's virtually silent...!!! I have an Eden 522 300w. It is very similar to the oase but taller (check it would fit in your cabinet with enough hose room) and cheaper (always a plus with me). I have had no problems with it at all though it is the first canister filter I've owned so I'm probably not 5he best to ask how it compares... served me well though. Flow is rated at 1000l/h. I use APS filters. Never had a problem with them and they're very easy (quick) to clean. I understand that APS filters can be a little... shall we say flimsy compared to other makes? But if the owner is aware of that there should not be a problem. Flow rates can be misleading. Some manufacturers quote the flow rate of an empty filter so as soon as media is put in the flow rate drops, often significantly. Other manufacturers quote the flow rate with media in place, but even there the actual rate will drop as the media gets dirty. I have a JBL Cristalprofi e1501. It’s rated at 1500 lph, but, it’s massive and comes with no heating. It will give you the required circulation though. I find the JBL’s easy to clean and they are robust. There is an e902 which pushes out 900 lph. 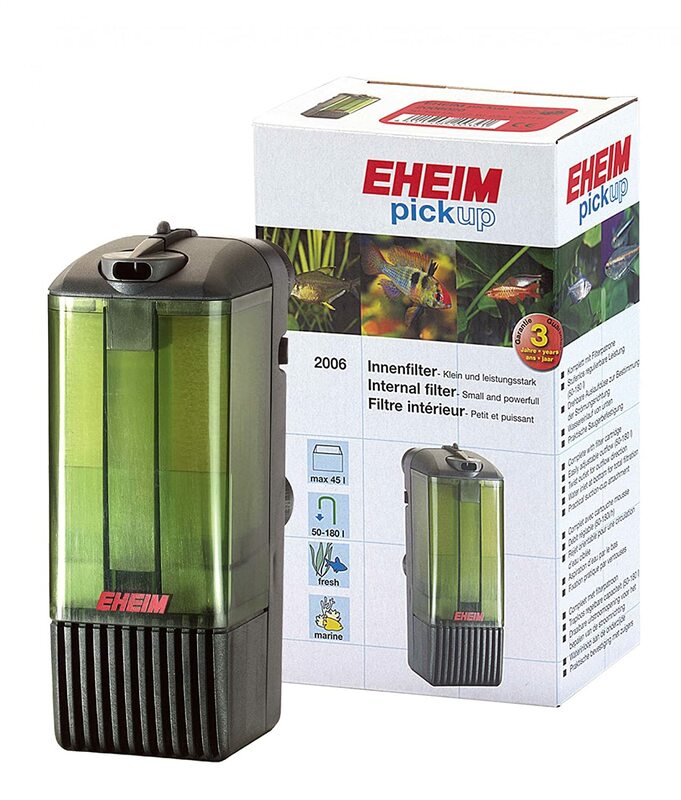 Although I've never had an external filter, I've read extremely positive reviews about Eheim ones and, to a slightly lesser extent, Fluval ones. I'm liking my new JBL internal filter. Which one did you get fcmf...? Very discreet in the back corner of the tank, very quiet/no sound, and seems to work well. Downsides always appear over time - my only complaint is that, when taking it apart to squeeze out the filter sponges, I find the various pieces don't always easily slide back into place together and there's a certain technique to it, but hopefully I've now mastered that. Eheim and Fluval do very good internal filters too - Sue can tell you about the former which I was very tempted by. I have had Eheim internals for years, both Aquaballs and Biopowers (which came out after I had the first aquaballs). Aquaballs contain sponges, with a small box for more sponge/carbon/floss/ceramic media, while Biopowers have sponges first and last in the direction of water flow with baskets of substrat pro (their equivalent of ceramic media) between the sponges. All have flow rate adjusters. Looking at the Eheims on Pro-Shrimp, they have the "Pick Up" range, with the 60 and the 45 looking ok, but that's presumably different to the Aquaballs & Biopowers...? Hmmmm... so they look like another option then, for sure... Would be a small one though, so as not to overdo the flow in the tank... The APS surface skimmer @ 350 l/h blows up a bit of a tsunami, lolol...!!! What do you consider as "an upgrade" Pierre, more than 850lph or better build quality than the one you have? Or both? Eheims have always been considered the 'Rolls Royce' of canister filters. But for me a good filter only needs to pump water and not leak. I used to favour Fluval, which were quite reliable. I also had some Eheims. The weak link for both of these was the canister clips, which tended to break over time. These days I prefer APS. They're simply made, which to me is a bonus because there's very little to go wrong, and I actually find the build quality to be very good. They probably use a bit more leccy than some but I'm ok with that. And the canisters are quite big relative to most other brands, which means you can get more media in them before the flow rate starts to drop drastically. If you want to increase the flow throughout your tank, a small powerhead at the opposite end to the filter might be better for the plants. It also gives you more flexibility with how the position the flow and affect surface agitation. Has anyone mentioned the Fluval 306 that’s rated at 1150 kph. I have one running on my 270 litre tank along with the JBL. Had no problems with it. Of those two Dave, I'd prefer the JBL by a mile... I know the Fluval stuff has its fans, but I've read way too many reports of Fluval canisters being a bit leaky... Love that 1150 l/h figure though, that sounds ideal...!!! Before you spend lots of money on a new canister filter, try googling filters for planted aquaria. I've been reading about the effects of live plants on stocking capacity and there was a lot of commentary on the role of a filter in a planted tank. In summary, in a planted tank, a filter provides mechanical filtration and water flow; the plants provide the biological and chemical filtration. I’ve always aimed for something approaching 10 times the capacity of the tank for circulation purposes. The JBL e1501, Fluval 306 and a Tunze Circulation pump pretty much approach that, allowing for losses. I do aim for a lot of surface water movement as well to minimise CO2 levels overnight. If I remember correctly, you inject CO2, @daveyng ? I think @TopCookie may have a lower tech set up. Yes, sorry forgot to mention that. I do inject CO2 so this probably cancels out the loss through the surface exchange. Is your algae situation still improving? What is your water change regime? You need to do 50% water changes weekly ideally when dosing like this. I realize that this thread was started almost eight months ago but I would like to add another suggestion. If the requirement is to increase circulation rather than filtration, why not add a circulation pump? In my 125 litre setup, I use a Eheim Ecco Pro 130 in conjunction with the Eheim streamON+ 2000, which can shift up to 2000l/h. Just a thought. Topics that relate to "Canister Filter Recommendations"
Any Recommendations for Juwel T5 Light Tube Replacements?